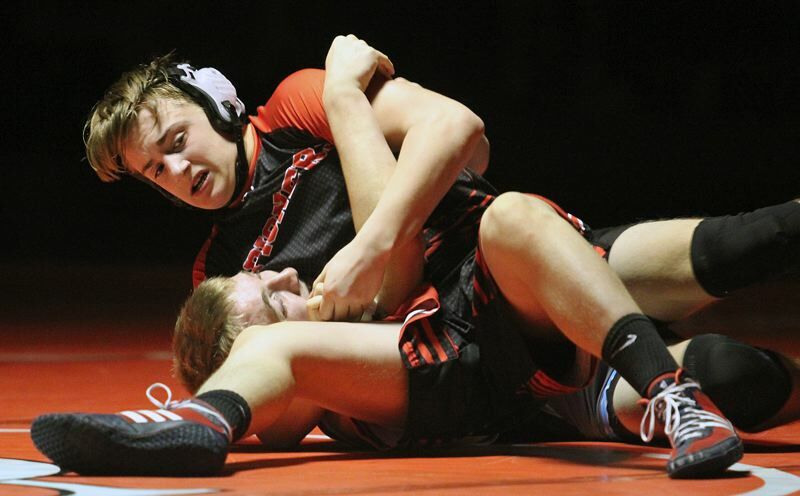 The Oregon City wrestling team struck first on Thursday. The Pioneers, hosting Lakeridge in Three Rivers League action at Oregon City High School, notched pins in the night's first two weight classes and grabbed an early double-digit lead. But the Pacers answered over the next five weights to close within a single point. When Oregon City hit the accelerator again, however, Lakeridge had no answer, eventually falling by a final score of 51-17. The key to the night, said Oregon City junior Sage Brown, a winner by fall at 132 pounds, was staying on task in every match. "We said 'Just stay off your back, don't give up, fire your shots off and believe,'" Brown said. For Oregon City senior Lane Marshall, the top-ranked 285-pounder in the state and a winner by fall on Thursday, the Pioneers just needed to focus on their own efforts regardless of opponent. "It's different being in the Three Rivers League, but it's the same concept, just different teams," he said, referring to the Pios' return to the TRL after spending the past four years in the Mt. Hood Conference. With the win — the team's second straight in league — the Pioneers improved to 2-1 in TRL action. Lakeridge, meanwhile, fell to 1-1 with the loss. Despite the final score, the Pacers took heart in the fact that they won five of the night's 11 contested matches and would have lost just 33-17 but for the three weight classes they forfeited. "What I thought it came down to was confidence," said Lakeridge senior Jonas Crowder, who posted a major decision victory at 182 pounds. "When we go out to wrestle, I think we need to go out and wrestle as a team that can challenge top teams like this. … I think we just need to be more aggressive." "We do have things we need to work on in practice — we'll probably work more on conditioning, focus on some techniques, but overall, we saw some steps forward," added Lakeridge senior Nolan Russell, who upset eighth-ranked Henry Schoenfeld at 195. The Pioneers started fast with pins in the night's first two weights — at 138 and 145 — with OC's Austin Nekvapil racing out to a 10-5 lead in the first period, then pinning Zach Nyman 29 seconds into the second round at 138. At 145, Henry Villarreal grabbed a 7-0 lead over Jack Rittenberg, took him down early in the second period and pinned him 36 seconds later. Lakeridge's Ryan Boucher stopped the bleeding with a 4-0 decision over Austin Canchola at 152 and started a streak of four Lakeridge wins in five weight classes. Quinn Brink — ranked third in the state at 152 — made it two in a row for the Pacers when he posted a 9-1 major decision over Barrett Bicha at 160. Oregon City's Mannix Perry slowed the Lakeridge momentum at 170 with an impressive 6-1 decision over Lakeridge's Jared Bartunek, but Crowder and Russell then won back-to-back to cut Oregon's City's lead to just 15-14. Crowder was solid from start to finish in his 12-0 win over Kenneth Walton, leading 2-0 after the first round, 5-0 after the second, then adding a takedown and two near-falls in the third to pull away. "I felt like I wrestled well. I was pretty strong," said Crowder, who improved to 13-0 with the win. "I should have pinned him a few times, but … I'm not too disappointed. I'm happy with it." Russell stepped up next against Oregon City's Schoenfeld, grabbing the lead on a reverse 37 seconds into the second period, seeing Schoenfeld duplicate that early in the third, and Russell winning on an escape with 1:12 left in the match. "He was ranked high but I didn't know that going in," Russell admitted. "I think my coach took that away from my thought process because I know that me personally, as soon as I see a number next to (an opponent), I try to bury it but it's still in my head so I think the key was just not thinking about my opponent, just focusing on myself the whole week." But Oregon City took over there, winning six of the seven remaining weight classes to pull away. That started with a forfeit victory at 220 and Marshall came through after that with a first-round pin of Lakeridge's Spencer Lenius at 285. Marshall got a takedown just five seconds into the match, did it again 20 seconds later, dropped Lenius a third time halfway through the round and pinned him with 36 seconds remaining in the period. "Nothing changes — I go out with the same mindset and try to finish him quick so I can get ready for the next one," said Marshall, who improved to 17-0 on the season. After another Lakeridge forfeit at 106, the Pacers notched their final victory — a 5-0 decision by Ian Healy over Emma Baertlein at 113. From there, Oregon City's Christopher Tyler pinned Ronan Chapman in the first round at 120, the Pioneers added another forfeit at 126 and Brown capped the night with a third-round pin of Cole Brink at 132. Brown, despite battling sickness, led 5-0 after the first round, managed two near-falls and a takedown to lead 13-1 in the second, then scored an early takedown in the third and pinned Brink 35 seconds later. "I've got to be honest, I don't feel the best right now," Brown said. "I would have rather gone out there, got off my shots early instead of waiting and waiting and waiting to the third round to get the pin." Next up, the Pioneers will host Lake Oswego at 7 p.m. Jan. 16, while Lakeridge wrestles at Tigard at 7 p.m. Jan. 17.